“It was the luckiest shot of my career,” said Bryce Aiken. Every so often, an individual performance dazzles and stuns an audience, leading a team to victory seemingly beyond all obstacles. 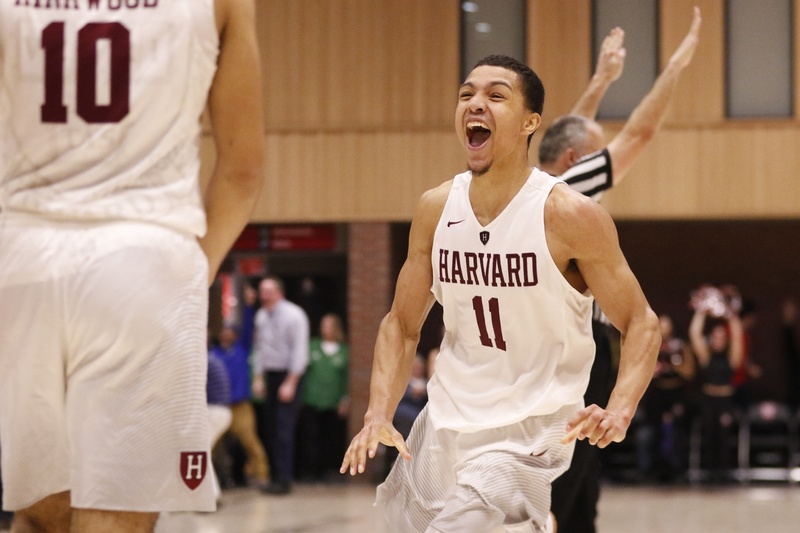 On Friday night, Aiken’s 44-point performance, one of the most incredible efforts seen in Harvard history, helped the Crimson cling to a 98-96 victory over Columbia in 3OT, in one of the greatest games ever played at Lavietes Pavilion. Columbia all but had it at the tail end of the first overtime, too. After sprinting out to a 77-71 lead with fewer than 50 seconds remaining, the Crimson (11-7, 4-1 Ivy) pulled off an incredible rally back to extend the contest for five more minutes. Accurate free throw shooting left Harvard down three with 4.3 seconds left. Aiken paced the ball up the court, as the Lions tried to foul intentionally, and was met by towering 6-foot-10 Lions junior Patrick Tapé. With only 1.6 seconds left, Aiken desperately heaved an off-balance, double-clutch shot and miraculously, it swished in as the buzzer sounded, to send the game to double overtime. Double overtime once again came down to the wire, with the Crimson up three heading into the final 27 seconds. However, Columbia (6-13, 1-4) was not ready to throw in the towel. Junior guard Jake Killingsworth knocked down a triple of his own to even the contest at 89-89. Aiken had the ball in his hands once again and held for the last shot, but his fadeaway jumper was no good. When Columbia’s sophomore guard Gabe Stefanini drilled a fall-away triple at the buzzer in regulation to send the game to overtime, some might have felt the momentum was with the Lions. But a charged Crimson bench showed no signs of nerves, clapping their hands, expecting the next five minutes to determine the winner — it turns out, it would take 15. 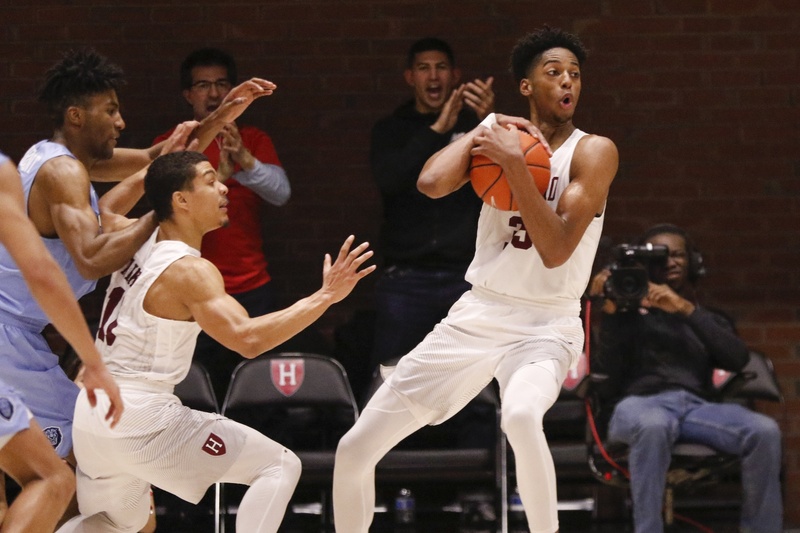 Harvard’s triple-overtime victory was the first contest to enter a third extra period since a 2009 victory over William and Mary. The game featured an astonishing 16 lead changes, and came down to the very last seconds of triple overtime. Aiken drilled two free throws, part of a 16-of-18 effort from the line, to give the Crimson a three-point lead. Stefanini had one more chance to tie the contest with a triple, but was met by the extended reach of junior forward Rob Baker — who swiftly denied his attempt from the corner. However, the game was not over, just yet. Columbia recovered the ball in the waning seconds and it landed in the hands of the Lions’ Quinton Adlesh. There was just 0.5 ticks left on the clock, but Adlesh was fouled in the act of shooting a three by Christian Juzang. With the Lavietes crowd roaring, on its feet, Adlesh front-rimmed the first free-throw, all but sealing the victory for Harvard. The Crimson defense clamped down during the final few minutes, holding the Lions to a field-goal-less final 3:12 of the game. The final buzzer left players and coaches alike shaking their heads, in disbelief over the 55-minute marathon that was finally complete. Bassey, who finished with 10 boards — only two fewer than team leader Baker — had a critical inbounds save in that final overtime frame. Juzang rimmed out on a three-point attempt with the Crimson clinging to a 96-95 lead, and the ball sailed towards the out-of-bounds line at the corner. But the Denver, Colo., native rushed towards the bench and recovered the ball — in an incredible show of hustle — shepherding it into the hands of Aiken for two critical free throws. Aiken’s 44 points were one shy of a program-record 45 point performance by Brady Merchant, in a 2003 victory over Brown. The junior guard’s jaw-dropping individual performance included 12-of-28 from the field, in an extremely taxing 46 minutes. It felt only appropriate that Aiken would be the hero, more than a year after the game against Columbia that forced him to miss the better part of a year. Aiken left the game gimpy multiple times, and was seen with a bloody knee - but refused to allow his injuries to be a storyline. Friday night’s game, in many respects, boiled down to Aiken versus Stefanini and Adlesh. Stefanini, a sophomore guard, knocked down 10-of-25 field goals for 26 points, while Adlesh scored 24 points of his own in a yeoman-like 52 minutes. 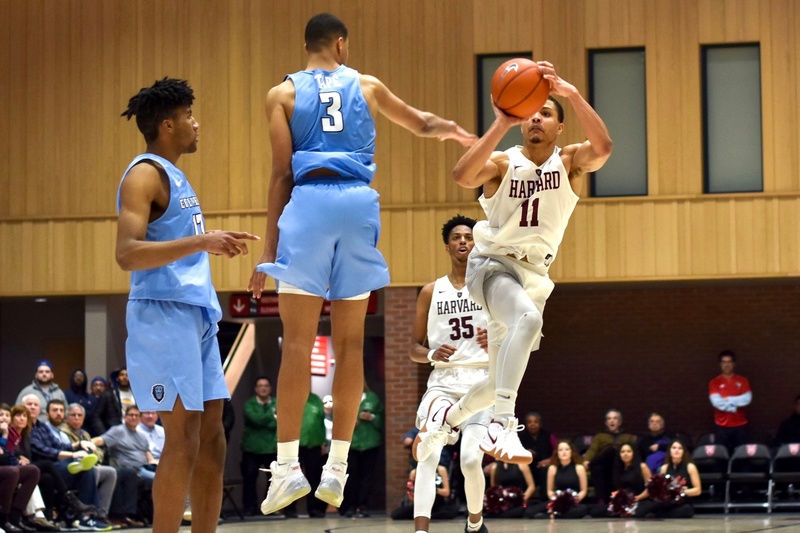 Despite Aiken’s second-highest point total in program history, the two Lions’ guards thrived on the visitors’ system of cuts, curls, and motion offense, and were able to keep Columbia in the game and weather several Harvard runs. Stefanini’s performance was particularly noteworthy. In the first overtime session, the Bologna, Italy native found himself over 30 feet from the basket, with the shot-clock under three seconds. Stefanini heaved a deep triple, that banked home, giving the Lions a six point lead with just over a minute left in overtime, making the game look out of reach for the Crimson. At the time, Harvard had lower than 10 percent chance of winning, according to ESPN’s Win Probability model. Friday’s wild victory took place in front of a duo of familiar faces for the Crimson. Columbia’s assistant coach, Kenny Blakeney, a former assistant for Amaker and the Crimson, returned to Cambridge opposing Harvard. Andre Chatfield, who graduated from the College and the basketball team last season, was also in the crowd on Friday night. Although a date with the Big Red looms in fewer than 24 hours, the Crimson will undoubtedly have an opportunity to process the miraculous effort of Aiken and his supporting cast on Friday night. 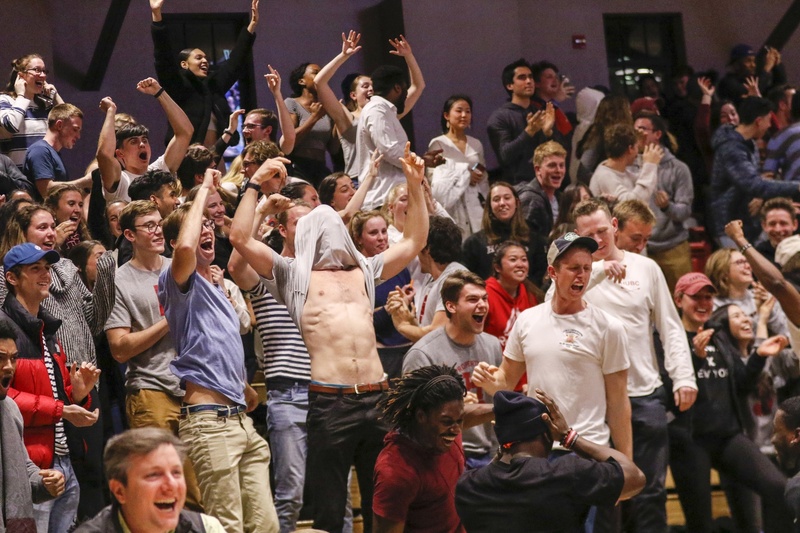 In a league that’s supposedly won on Saturdays, Harvard put forth its bid for the most compelling game of the 2018-2019 college basketball season, on a marathon of a Friday night.